Skeptics and unbelievers immediately scoffed at the story of the miraculous survival and rescue of Nadia Bloom, who survived 4 days and nights in a Florida swamp and was then rescued by James King who was guided by God to her location in the swamp. Detailed responses to various accusations about the incident are given, including why James King could not have found Nadia Bloom by luck, why the incident could not have been falsified, etc. Parallels are drawn between the skeptics and scoffers of this survival and rescue with those who are skeptical about Jesus Christ. In the posting “The Survival and Rescue of a Lost Autistic Girl – Modern Day Miracle“, I wrote about the miraculous rescue of Nadia Bloom, a mildly autistic 11 year old Florida girl who survived 4 days and nights lost and alone in an alligator infested swamp. Her rescuer, James King, was directed by God to search for and find her on 4/13/10. If you are not familiar with the story of Nadia’s rescue, or if you have not read the account of that event, please do so now before reading this posting. Almost immediately after Nadia’s rescue, the skeptics, scoffers, and unbelievers hit the blogs, projecting their doubts about every detail of the story. Some claimed that the whole thing was a fabricated hoax, like the “balloon boy” incident. Some demanded investigation for abuse. Some claimed that her rescue was pure luck. Some doubted the story itself, that Nadia was lost for 4 days. Furthermore, in both Old Testament and New Testament days, people refuse to believe in spite of miraculous signs. In spite of plagues of blood, gnats, flies, frogs, boils, hail, livestock, locusts, darkness, and the firstborn, Pharaoh’s heart was hardened and he refused to believe Moses. (Exodus 7-11). In Revelation, people refuse to believe in spite of the trumpet and bowl judgments. So, it is not unexpected that there will be scoffers and doubters of modern day miracles, such as the rescue of Nadia Bloom. So, what are we to make of the accusations of foul play and falsehood? The police interrogated rescuer James King immediately after the incident and found no evidence to suggest foul play. James King took no offense to being interrogated, and said that the police were simply doing their job. Nadia was hospitalized and checked over after the incident, and her condition was found to be consistent with spending four days in a swamp, with no evidence of abduction or foul play. Nadia was interviewed on television a few weeks later, and she detailed how she got lost, and how she survived. This included sleeping in a log, a stump, under a bush, and under leaves. She described eating a green plant with a spongy interior after spitting out unpalatable fern leaves. She described the wildlife she saw, the rescue helicopters overhead, and has documenting photographs from a digital camera (which were also analyzed and then released by the authorities). Her story is consistent with surviving four days in the swamp. James King’s whereabouts during this ordeal are fully known, and his time can be accounted for by his family, employer, and fellow church members. During James King’s interviews after the rescue, he consistently glorifies God and considers himself humbled to be used by God in this rescue. There is no secondary gain or ulterior motive. The amount of work that would be required to stage an abduction and rescue in a swamp is virtually impossible. Even if Nadia had somehow been abducted and led out to the middle of the swamp, it is doubtful that the abductor would even be able to find her again. Additional Comment: These theories of staged plots remind me of the theory that Christ somehow survived his crucifixion and then was taken from the tomb by His disciples and nursed back to health. When one takes into account the severity of the Roman scourging, crucifixion, and even being pierced in the heart by a spear, this false theory is ludicrous. Accusation: James King found Nadia by luck. Response: James King did what innumerable rescue teams including dogs and aircraft overhead could not do. And he did it with great efficiency, choosing a nearly straight path to find Nadia within about 2 hours from the swamp edge. This level of efficiency was confirmed by the rescue team also taking about 2 hours to get to Mr. King and Nadia once their location in the swamp was verified by GPS and visually by aircraft. Mr. King stated that his path to Nadia was directed by God, and that he does not believe in luck. When he was within about 40 yards of Nadia, he could hear her response to his calling out to her. So, what is the chance that Mr. King could have randomly picked a path by luck to Nadia? The swamp that Nadia was lost in (shown below) was roughly 1 square mile in area, bordered by the road on the left (.9 miles), the road at the bottom (.5 miles), the diagonal up to the lake (1.2 miles) and the lake border (1.4 miles). If that area is divided into blocks of 40 X 40 yards (the distance that Nadia’s verbal response could be heard), there are 1936 40-square-yard blocks. So, it would seem that there would be a 1 in 1936 chance of picking Nadia’s location. However, it is more complicated, because a path had to be chosen to reach her. There were 2.8 miles of swamp edge to start the search (excluding the inaccessible lake border). Divided in to 40 yard blocks, that equals 123 possible starting points. Since Nadia was about 1/2 mile into the swamp, at least 22 40-square-yard blocks had to be traversed to reach her. If one randomly chooses to move forward, left, or right from a given block and travels a total of 22 blocks, there are approximately 24 billion possible unique random paths, with only one reaching Nadia’s block. There are many different patterns of searching that Mr. King could have used to find Nadia. He could have searched in a crisscross pattern, a grid pattern, a looping pattern, an out-and-back pattern, and even an easiest or safest-to-travel course through the swamp. It was through God’s guidance that he chose the correct starting point and the nearly straight course to reach her near the swamp’s center. By these calculations, the odds of picking this optimal path to Nadia randomly are extremely low, approximately 1 in 24 billion. 24 billion is then number 24 followed by 9 zeros. Additional Comment: Jesus fulfilled over 300 prophecies in the Bible. It has been stated that the chance of one person fulfilling all of these prophecies, as Jesus did, randomly would be 1 in 1 followed by 157 zeros. As a point of reference, the number of atoms in the universe is estimated to be 4 followed by 79 zeros. 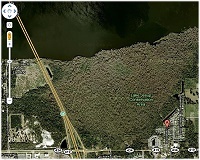 An aerial image of the swamp near Lake Jessup where Nadia was lost. The swamp area is roughly 1 square mile. This area can be divided into 1936 blocks of 40 square yards. Click photo for a larger image. 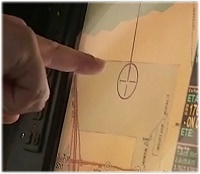 Helicopter GPS showing Nadia’s location in the middle of the swamp. This is about 22 blocks (40 square yards) from the border of the swamp. Click the photo for a larger image. Accusation: If would be more believable if Nadia had only been lost for 1 day in the swamp. Response: It appears that this blogger is denying that the entire event even took place, referring to the time period that Nadia was lost like a movie script rather than reality. Some people need hard evidence to believe. In the Bible, Thomas was such a person, denying that the resurrected Christ was real until he could physically touch the nail holes in Christ’s hands. For people like this, it may be useful for them to experience as much of the event as possible with their own eyes and ears to help them to build their faith. For those people, and for anyone else interested, below is a sampling of the photographs taken by Nadia Bloom during her ordeal lost in the swamp. Click on each photograph for a larger view of the image. All of these photographs were taken by Nadia Bloom while lost in the swamp. Accusation: Some people believe that God has granted James King special powers to locate a lost child like Nadia, and that he should use these powers to locate other lost children. Similarly, some people are angry that while God allowed Nadia to be found and survive, why are so many other lost or abducted children never found? Response: The answer to this question is based on the nature of God and His relationship with man, the purpose of miracles, and the reason that God allows pain and suffering in the world today. James King has stated repeatedly that he became involved in this rescue because he prayed to God for guidance, and then he listened to and obeyed God’s answer. He does not claim to have any special power except what was given to him by faith through the Holy Spirit. He was used by God as an instrument to accomplish God’s will. In the Bible, it is said that God wants to have a relationship with us (ref. 1,2,3) that God has a hope and a future not to harm but to prosper us (ref. 4,5) , and that God loves us so much that He gave his one and only Son, Jesus Christ, as an atoning sacrifice for our sins (ref. 6). Furthermore, God is sovereign and all powerful (ref. 7,8), His will and purposes are His own (ref. 9) , and His thoughts and ways are more than we can know or understand (ref. 10). God is not a genie that we can summon to perform miracles or to grant us special powers. However, if we are in alignment with God’s will, we may be given the strength to do things that we would otherwise not be able to do (ref. 11). In the Bible, miracles are not just random acts of kindness, but are used to show God’s power (ref. 12), to enlighten people to the presence of God, to bring people closer to God (ref. 13), to build up believer’s faith (ref. 14), and to provide a means for salvation (ref. 15). Nadia’s survival and rescue were miraculous, but James King’s outspoken proclamation of God’s saving grace and power to the world is what has really accomplished God’s will. This is the real miracle: many people have been brought closer to God and even achieved salvation through James King and Nadia. Finally, why are other children are lost and never found? Is this God’s fault? No, it is actually man’s fault. At the time of Creation, we were brought into a world without sin, but were given free will (ref. 16). When Adam disobeyed God in the Garden, sin entered the world, and our relationship with God was broken (ref. 17). From that point on man has been subject to pain, suffering, and death. In fact, all of Creation groans under the weight of mankind’s sin and continued disobedience of God (ref. 18). God has provided a way for us to get back to Him, by providing Jesus as a sacrifice for our sin. Belief in Jesus Christ as our personal Lord and Savior brings us back into fellowship with God (ref. 19). Like Nadia being rescued from the swamp by James King, we are rescued from our sin and separation from God through faith in Jesus Christ. Alan, thank you for this. While experiencing this, my prayer was that whatever the outcome was, that God would be glorified. I tried to put my own overwhelming desire to have Nadia come home to us aside, and seek God’s purpose in this. I had to accept and make peace with several different possible outcomes. Praise God, that he saw fit to give us the desires of our heart! Even if he had not, he is still God.